Sandhya Ekneligoda said that although several investigations have been carried out into the disappearance of her husband, journalist Prageeth Ekneligoda, none of the investigation reports have been made available to her so far. She alleged that there are certain sections of the Army which may hide the investigation reports compiled by the Army into the disappearance of her husband. Ekneligoda said investigations into the disappearance of her husband were undertaken following several appeals made by her to the government. Ekneligoda was speaking to the media after she called on the Most Ven. Tibbotuwawe Sri Siddhartha Sumangala Mahanayake Thera of the Malwatte Chapter at the Malwatte Viharaya in Kandy and received his blessings yesterday. 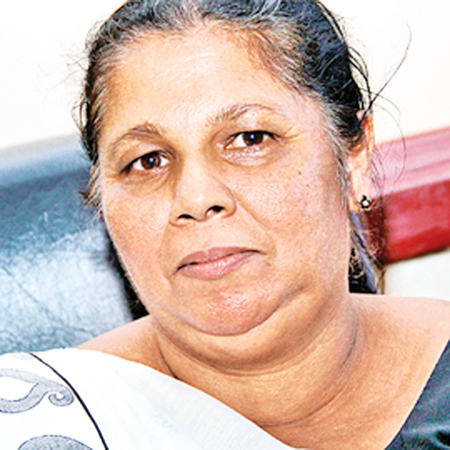 Ekneligoda said she called on the Malwatte Prelate to brief him on the proposed religious satyagraha she had planned. She said that it was the Rajapaksa regime which was responsible for the disappearance of her husband. She had no doubt about it. But there was a possibility of sections of the Army trying to send the reports of investigations made by the Army, underground. There is doubt about the release of such reports in a situation where the President is protected by the Armed forces, she said. Ekneligoda said she has made many attempts to meet the President to inform him about the injustice caused to her, but she has never received an opportunity to do so. She also inquired from the Office of Missing Persons (OMP) about the whereabouts of her husband, but the OMP has not found a solution to her problem, since it remains an office only.